Richie Call an assistant professor in the BFA Acting Program at Utah State University has a family connection to the Caine Lyrid Theater. His grandfather Vosoco Call was instrumental in acquiring the Theater for the University in the 1950's. 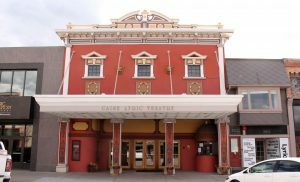 The 106 year-old Caine Lyric Theatre, located in downtown Logan at 28 West Center, is one of the few downtown buildings restored to look like an authentic historical building. The historic 106 year-old Caine Lyric Theatre, located in downtown Logan at 28 West Center, looks like an historic, authentic early building. The building was converted into a theater after a fire destroyed the Thatcher Opera House in 1912. By 1913, the Lyric theater was finished and being used for productions. He said it operated as a playhouse until after WWII, when it closed and fell into disrepair. 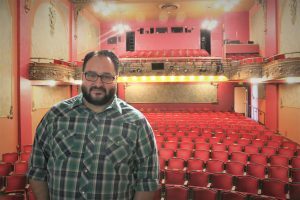 Call is an assistant professor in the BFA Acting Program at Utah State University and has a family connection with the theater. He remembers hearing of his grandfather, Vosco Call, using the theater while going to college. The theater was empty and he got permission to use it. “He showed movies and charged people 25 cents to get in,” Call said. “When he went to grad school, it fell empty again. 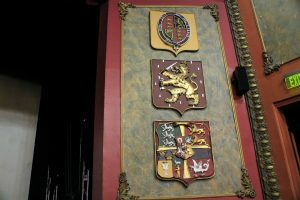 The Thatcher family crests line both sides of the stage at the Caine Lyric Theater on Center Street. In 1967, the university began to run the Lyric as a summer theater to bridge the gap between academic theater and professional theater, so students could prepare for life beyond college. That same year, they got some money to help fund the company. They did two shows that year; then, in 1969, three shows. This year they are doing six shows and utilizing the downtown Lyric Theater, as well as two theaters on USU’s campus: the Morgan and Black Box theaters. They are starting to see an increase in young people coming to the theater. The formula must be working. This is their 54th season of uninterrupted production, and it gets stronger every year. In 2000, using old photographs, the university restored the building as close as they could to its original state. They later purchased the building next door and added restrooms and changing rooms. The family crests that line both sides of the stage are the Thatcher family’s. Richie Call the co-artistic director of the Lyric Repertory Company shows the ornate trim in the theater that was restored to its 1913 look. The 378-seat theater is listed on the Utah State Historical Register and is the home to the Lyric Repertory Company and hosts USU Opera program performances. There is a lot of ornate molding and carvings on the walls. The seats may have been recovered, but they look just like you would expect to have seen back in the day. For an opportunity to get a glimpse of what a theater looked like in the early 1900’s, attend one of the productions at the Cain Lyric Theater this summer.